Whew! After some long months of hard work I can finally talk about this awesome project! As you may know, I co-founded Midwestern Gothic because I think the Midwest is gorgeous, but overlooked. I get to meet and read all sorts of phenomenal work from people around the region through the literary journal. And now, we’re expanding! MG Press is a micro-press devoted to publishing a small number of titles each year. An extension of the literary journal Midwestern Gothic, MG Press retains the same core values: shining a spotlight on Midwest authors by focusing on works that showcase all aspects of life—good, bad, or ugly. AND, to double down on the awesome news, we’re announcing our first book! 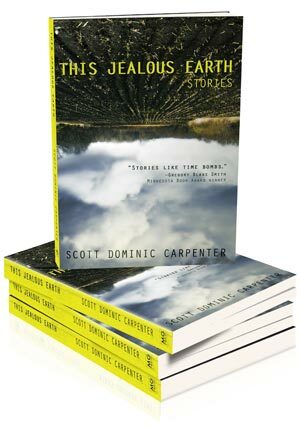 This Jealous Earth from Scott Dominic Carpenter. I can honestly say, out of all the submissions we got, this was one of two collections that really grabbed me – every single story took me for a ride. At the end of the day, I knew if MG Press didn’t put it out – I’d regret it. I’m so happy we and Scott could unleash this on the world. There’s plenty more information here, so go check it out!